As you prepare to bring your new puppy home you will no doubt be full of excitement and perhaps a little anxious. That age old saying of 'by failing to prepare, you are preparing to fail' can be your biggest strength though. It's easy to see how it could be a stressful or disorientating process for any puppy as they land in amongst their new surroundings. Your home is full of new noises, objects and people and at the same time, he has been separated from his usual source of comfort and reassurance, but by preparing your home you can help them to settle in much easier. Firstly, what should you have at home for your new puppy? 1. Stainless steel, non-tip food and water bowls - consider a stainless steel dog bowl stand or raised feeders which are adjustable. 2. An adjustable collar and lead set (consider using a “breakaway” collar with plastic clips that will unsnap in case your dog gets hung up on something) with an ID tags which includes your dog’s name, your name, phone number and your chosen vet practice's name and phone number included. 3. You might consider using a crate or kennel that will accommodate your puppy's current size but be large enough for them to use as they grow. This crate will serve as your puppy's new 'den' at home, when travelling or riding to the veterinary clinic. His scent in the crate will provide comfort and a sense of security during these stressful times. 4. A carpet stain remover for accidents while you're house-training over the coming weeks. 5. Brushes and combs suited to your dog’s coat; ask your vet or local pet shop about an appropriate brush or comb for your dog. Never under estimate the power of bonding through grooming so this is hugely important. 6. Health essentials such as dog shampoos and parasite controls for when the time comes. 7. High-quality, safe chew toys to help your puppy cope with teething pains. 8. Choose a food that you're happy with which will give them all the nutrients needed to grow keeping them healthy on the inside and out. 9. Make sure you have some healthy dog treats handy so you can reward them while training and learning the basics as they grow. - Use stainless steel or ceramic, non-tip food bowls, which won’t break or absorb odours. - Toys with parts that squeak or whistle can be dangerous if swallowed, so look for puppy toys which are designed to be more safe for smaller and teething mouths. - For a comfortable collar fit, allow for two-fingers of space between the collar and your puppy's neck, consider using an adjustable collar so it has the option to grow with your puppy. - Keep breakable objects out of reach. - Deny access to electrical cords by hiding or covering them; make outlets safe with plastic outlet plugs. - Safely store household cleaning products, remember puppies are inquisitive little things! - Some plants (indoor and outdoor) are poisonous to dogs so keep the following plants out of reach: poinsettias, azaleas, rhododendrons, dumb cane, Japanese yew, oleander, lilies and English ivy, among others. -In the garage, be sure engine lubricants and other poisonous chemicals (especially antifreeze) are safely stored. - If you provide your dog with an outdoor kennel, place it in an area that provides sun and shelter in the pen; be sure the kennel is large enough to comfortably accommodate your dog. - Be consistent. All family members should use the same name - don’t use confusing nicknames or variations. - Reward your dog’s attention/name recognition with lots of praise and play. Step 1: Before bringing him in the house, take him to the area in your garden that will serve as his “toilet” and spend a few minutes there. If he goes, praise him. If not, proceed into the house but be sure to take him to this spot each time he needs to go to the toilet. Step 2: Take him to the room which will serve as his new “den” for several days. Put bedding and chew toys in the room, Let him investigate the room. If he chews or urinates on his bedding, permanently remove it. Step 3: Observe and interact with your pup while he’s acclimating to his new den. This will help forge a sense of pack and establish you as the pack leader. - Supervise your dog at all times and interact with him regularly. - Be alert for signs (sniffing and circling) that he has to go to the toilet, then take him outside immediately. - Don’t punish an accident. Never push his nose in the waste or scold him. He won’t understand, and may learn to go to the toilet when you’re out of sight. - Praise your dog every time he goes to the toilet outside. Never make the mistake of treating a puppy like an adult dog. Treat him the same way you would a child - with patience, constant supervision and a gentle touch. The way you interact with your puppy at this age is critical to his socialisation. Remember...a young puppy has no bladder control and will need to urinate immediately after eating, drinking, sleeping or playing. At night, he will need to relieve himself at least every three hours, during the day at least once every hour. Ideally, your children should help you choose your new dog. When you bring him home, don’t let them play with him constantly. Puppies in particular need a lot of rest just like a growing child. Limit dog-children play sessions to 15-30 minute periods two or three times a day. - Young children may be tempted to shout at a dog if they think he’s doing something wrong. Be sure they understand that puppies and dogs can be easily upset and startled by loud noises. - No teasing. Keeping a toy just out of reach will reinforce bad habits such as jumping up and excessive barking. - Wagging tails and play biting can be too rough for some young children. Teach the children to cross their arms or put their hands in their pockets if the dog has a tendency to play bite. Supervise all interaction and separate them if the play is too rough. - Teach children to care for a dog by showing them how to feed and groom him. Keep resident pets separated from your new dog for a few days. After that time, let pets smell and touch each other through a slightly open door. Do this several times over the next few days. After that, give the resident pet access to the den area with your new dog. Supervise their meeting and go back to through-the-door meetings if trouble arises. Switching your pup’s diet to a new food takes some planning. Because dogs are creatures of habit, it is not uncommon for them to prefer their current food to a new food. They, like humans, can become accustomed to a food and may not welcome a disruption in their routine. For this reason, it's always good to get some food from your dog's breeder so that any change over can be handled in a gradual way. Introduce the new food gradually,this is the most successful way to ease your dog into the change in diet. Start by mixing 25% new food with 75% old food. Slowly change the proportions over the next three days or so by gradually increasing the amount of new food and decreasing the amount of old food. At the end of this weaning process, you should be feeding 100% of the new food. You may encounter some difficulties, such as your dog choosing to eat only the old food, or not eating at all. Not to worry, a healthy dog can miss meals for a day or two with no ill effects. When you first bring your puppy home, try and establish routine as quickly as possible. It’s always tempting to make the dog’s first few days full of play and excitement. This can lead to problems though, so get the dog settled in, show them they have their own private area of the home which is just for them and let them settle in and relax. Your dog's breeder or rescue centre will provide guidance also based on experiences. Don’t do too much too soon. Dogs can be excitable and whilst it may be tempting to show your new dog off to all your friends, family and neighbours, too much too soon can make the dog unsettled early on. Gently introduce them to new things. 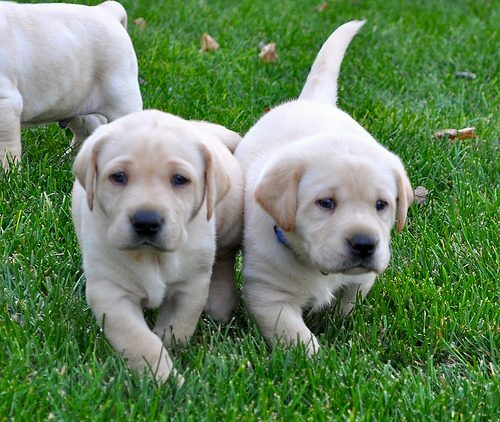 Of course, if your puppy is not yet vaccinated then they will have to stay at your home until they are up to date and ready to meet the outside world. If you encounter problems with the puppy, be prepared to call the breeder/shelter, speak to a vet or get the advice of a professional behaviourist. Too often people let little problems develop into big problems because they weren’t sure who to turn to for advice. Remember, with dogs there is never such a thing as a ‘silly question’. Finally, be prepared to love your new puppy for the rest of its natural life. You've made a lifetime commitment. There will be challenges and times of frustration or even stress, but those moments will be far outweighed by years and years of unconditional love over the long-term. If you've just brought a new puppy home, please do let us know all about your new friend and feel free to share your own tips and advice for soon-to-be puppy owners!